You can make this soup vegan by omitting the cream and cheese when you serve it. If you want a spicy soup, add one Serrano chile to the recipe. It will add kick but won’t overpower the soup. 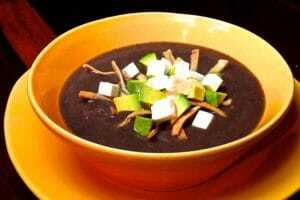 A quick delicious Mexican black bean soup. Roast the tomatoes, onion, and garlic until they are blackened. You can do this under the broiler or in a pan on the stove. Place the blended soup in a pan on the stove. To serve, divide the soup into 6 bowls. Garnish each bowl of soup with the tortilla strips, 1 tablespoon of Mexican cream, 1 ounce of cubed queso fresco cheese, and the cubed avocado. If you use canned beans, be sure to rinse them well to remove the excess salt.You can substitute mozzarella for the "queso fresco. "The soup will keep 3 or 4 days in the refrigerator. If you are using the serrano pepper, do you roast it with the other vegetables? Thank you!